This is a guest post by our friend Sam Duregger of Woodshed Tea. A close up look Taiwanese oolong tea bushes, from the plantation we source our High Mountain Oolong Tea. When you think of something aged, the first thing that comes to my mind is a nice barrel aged whiskey, or maybe an expensive bottle of wine… of which I’ve never had the wallet paunch to actually order. As you are well aware, in the world of alcoholic beverages, quality and high price are often associated with the “aged” moniker. This prestige does not transfer well to the world of light to medium roast coffee — fresh is best. Both in sourced green beans, and the roasted on date. Time matters and too much of it is thought to be detrimental to the “perfect cup” each genus of coffee aspires to be. I love this about coffee, it’s a tangible experience, as I sip this seasons best, brewed to perfection and served within a week or two of roast. When we begin to venture into the tea world we find time to be on our side fresh is great, and aged is also… great! To understand this difference in perspective, it might be best to run through a quick guide on tea type and it’s requisite shelf-life. The below timelines assumes tea stored in a dry, dark, airtight and odor free place. Green tea is unfermented and will begin to fade in flavor after 16 months. Black tea is dried or fermented and will begin to fade in flavor after 2-3 years (properly stored). Oolong tea is a semi-fermented tea with a shelf life of 2 years. Though some exceptions do influence the longevity of the tea, including degree of fermentation and processing. White tea can be stored for approximately 2 years, and may begin to lose it’s flavor. Processing is an important caveat, as “aged white tea” has medicinal value and is found to be more valuable as the time range increases. 5 years is a well appreciated product, and 10-20 years aged becomes a highly valued product in the tea world. Pu'erh is a common fermented tea categorized as raw or ripe. The maximum storage limit is unknown as properly stored Pu’erh will last indefinitely and increase in value (and flavor) as it ages. First off, it is probably prudent to note, all the types of tea presented above come from the same plant — the camellia sinensis. It is the plucking and processing that gives the tea its category (green, black, white, oolong, peurh, et cetera), and the region that gives each tea its name (Yunnan, Darjeeling, Sencha, et cetera). So, to understand how a tea is “aged” we must make a distinction between aged by fermentation and aged by oxidation. And without going into full geekery mode, we are going to talk in generalities, as the variables are quite infinite. Pu'erhs are made by processing green tea in a way that promotes fermentation as noted above. This fermentation process creates a very unique earthy aroma to the tea, which increases in value and flavor as the years pass by. Most puerh is packaged as a “puck” of tea, which is both easily transported and stored. Processing is pretty straightforward, as the tea is withered, rolled or pucked, and then stored to ferment. Non-feremented black teas are withered, oxidized, and then dried — in which the oxidization process stops the chemical process that would lead to fermentation. 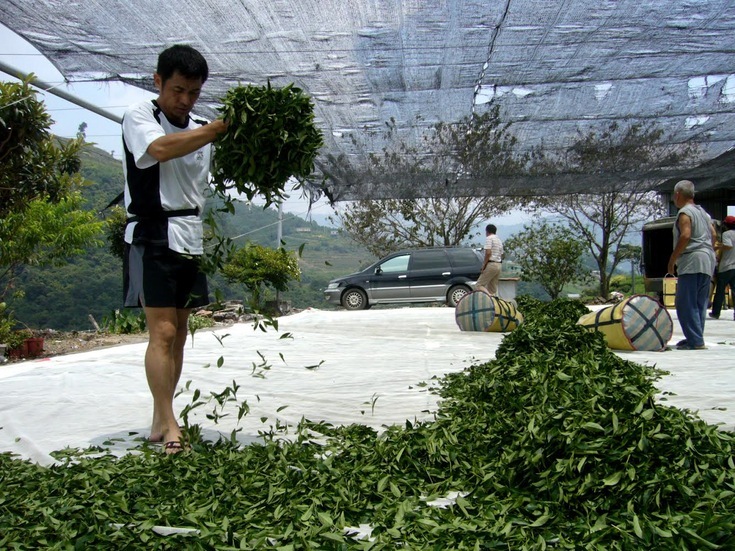 Most oolongs utilize a similar process to black in that they are withered, rolled, oxidized, then fixed so that the green elements remain, but the fermentation is limited. Taiwanese high mountain green tea being set out for withering in the sun. Tea roasting then set to age in the bamboo basket with steel base to keep moisture out. What these pictures show is only a fraction of the process as outlined above. Care and craft are a couple of the words I would use to describe this dedication. And the tea we get to enjoy showcases this care with its herbal frangrance of thyme and dried basil, with a hint of malt. Once steeped you will begin to smell buttered toast or popcorn, and your tastebuds will also pick up on the buttered popcorn, with a hint of honey and a smooth mouthfeel. This is truly one of our favorites. And can be enjoyed multiple times with a re-steep of up to 5 times… each steep will bring different notes as the leaves fully expand and release all of the flavor found at first pluck, but aged to perfection.